Burgess Hill Town boss Ian Chapman believes if his side work for each other like they did against Worthing on Bank Holiday Monday, they will be fine. 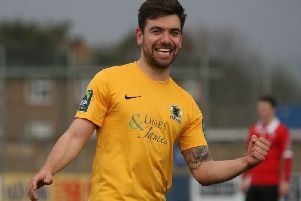 The Hillians suffered an ‘unacceptable’ 6-1 home defeat to Enfield Town on Saturday, but bounced back to claim a creditable point at Worthing. And Chapman was pleased with the response he got from his players. He said: “Saturday was unacceptable. He added: “But they put in a real shift yesterday against a decent side who you have to concentrate and work hard against and we did that. Chapman’s men face Sussex rivals Whitehawk at the Green Elephants Stadium on Saturday and the manager knows it will be a tough test. He said: “They will be decent. They come down last season but they still have a lot of quality there and it’s a another derby game. “This sounds stupid because we conceded six on Saturday but we do look more solid, in the other four games we have only conceded three goals. “We are working really hard and in training hopefully put something together to give Whitehawk and really hard game and get a win. Chapman was pleased to have a full squad to pick from for the first time against Worthing. He said: “We could put out the 11 we wanted to, it picked itself for the game. Another week it might be different. The Hillians face Faversham in the Velocity Cup on Tuesday night and Chapman will use that game to give some players who have not featured a lot minutes on the pitch.